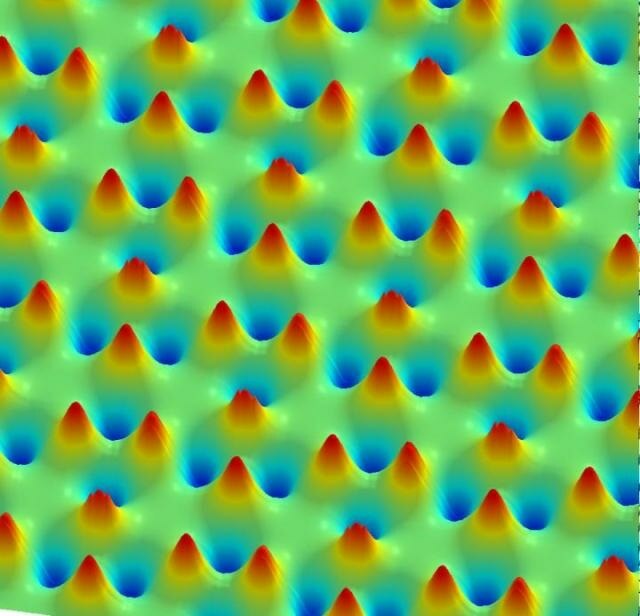 Researchers from the U.S. Department of Energy's (DOE) Argonne National Laboratory and headed by Zhili Xiao, Northern Illinois University physicist and Argonne materials scientist, have developed a new type of material dubbed, 'rewritable magnetic charge ice'. This material allows an unexceptional level of control over local magnetic fields that could provide new opportunities towards next-generation computing technologies. The May 20, 2016 issue of Science features a research report on the production of magnetic charge ice. Xiao highlights that magnetic charge ice could play a significant role in quantum computing and can also lead to more powerful and smaller computers, thanks to its potential applications involving memory, data storage, and logic devices. Current magnetic storage and recording devices (e.g. computer hard disks) contain nanomagnets with two polarities. Each polarity is used to denote 0 or 1 - the binary bits or digits that are utilized in computers. It is possible for a magnetic charge ice system to have eight configurations instead of just two, resulting in more functionality or denser storage capabilities not found in the currently used technologies. Our work is the first success achieving an artificial ice of magnetic charges with controllable energy states. Our realization of tunable artificial magnetic charge ices is similar to the synthesis of a dreamed material. It provides versatile platforms to advance our knowledge about artificial spin ices, to discover new physics phenomena and to achieve desired functionalities for applications. For the past 10 years, scientists have developed an increasing interest in developing, analyzing, and attempting to control the unique properties of artificial spin ices. The spins in these ices comprise of a lattice structure that obeys the proton positioning order present in water ice. Researchers believe that the artificial spin ices are scientific playgrounds, which will help them explore and reveal the mysteries of magnetism. Researchers in the past have unsuccessfully tried to achieve local and global control of spin-ice magnetic charges. In an attempt to overcome this challenge, Xiao and his team decoupled the magnetic spins’ lattice structure and the magnetic charges. The researchers accurately and effortlessly tuned the magnetic charge ice to any one of the eight charge configurations using a bi-axis vector magnet. A magnetic force microscope was then used to illustrate the local write-read-erase multi-functionality of the material at room temperature. For instance, the word “ICE” was written on the material with the help of a custom designed patterning method. This word was written in a physical space that seems to be 10 times smaller than the diameter of a human hair strand. Magnetic charge ice contains an extremely thin layer of atoms and is considered to be two-dimensional, it is also capable of being used with other materials like graphene. Further, Xiao stated that the material is also inexpensive to produce and environmentally friendly. Yong-Lei Wang, a former postdoctoral research associate of Xiao's, is first author and co-corresponding author on the Science article. The new artificial magnetic ice structure was designed by Yong-Lei Wang, who was also responsible for building custom instrumentation for the entire research. Although spin and magnetic charges are always correlated, they can be ordered in different ways. This work provides a new way of thinking in solving problems. Instead of focusing on spins, we tackled the magnetic charges that allow more controllability. Xiao pointed out a number of issues that need to be solved before using magnetic charge ice in technological devices. For instance, a bi-axis vector magnet is expected to recognize all energy state arrangements and configurations. It is indeed a challenging task to integrate this kind of a magnet into commercial silicon technology. Talking about the applications in conventional computing, Xiao highlighted that quantum computing could gain a lot from magnetic monopoles present in the charge ice. Magnetic charge ice could also be used to improve the existing carrying capability of superconductors. In addition to Xiao and Wang, members of the research team include Xiao's Ph.D. student Jing Xu; scientists Alexey Snezhko, John E. Pearson, George W. Crabtree and Wai-Kwong Kwok in Argonne's Materials Science Division; and scientists Leonidas E. Ocola and Ralu Divan in Argonne's Center for Nanoscale Materials. The research was conducted at Argonne National Laboratory with support from the National Science Foundation and the DOE's Office of Science.